Anyone visiting Cape Town, South Africa, should consider a day trip to Kirstenbosch National Botanical Gardens. Located just a few kilometers south of the old city center of Cape Town, the Kirstenbosch Gardens are acclaimed as one of the great botanic gardens in the world. The grandeur of the setting alone, on the eastern slopes of Cape Town’s Table Mountain, makes these gardens unmatched for visual drama. 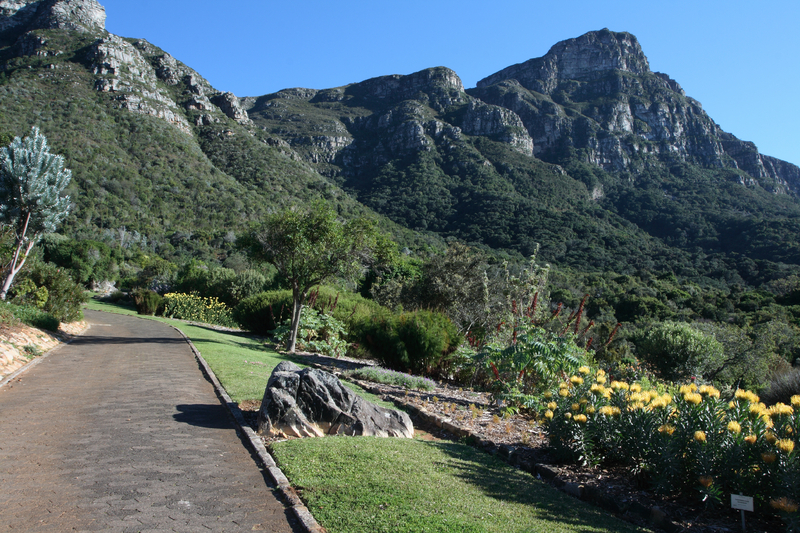 Kirstenbosch Gardens were established in 1913 to conserve and display the richly diverse flora of region, and was the first botanic garden exclusively devoted for this purpose. With over 7,000 species under cultivation and over 22,000 indigenous species naturally preserved, the gardens display an immense variety of the flora of the area, as well as rare and threatened examples from all the diverse regions throughout southern Africa. The beautiful botanical gardens cover 36 hectares out of the 528 hectares of the grounds. Most of the estate is mountainside nature preserve supporting natural forest and fynbos, along with a variety of native animals and birds. Kirstenbosch lies in the middle of the Cape Floral Kingdom, also known as the Cape Floristic Region, which in 2004 was declared a UNESCO World Heritage Site. The gardens are a celebration for the eyes, showcasing the diverse variety of South African plants. Fynbos and Proteas, Cycads and many more are intermingled across rolling lawns, with streams and ponds and meandering yet well-planned paved pathways for easy walking. There are plaques and signs placed along the way to provide information about the various trees and plants on display. There are two restaurants on the grounds: The Botanical Café and the Silver Tree Restaurant, and picnic luncheons can be arranged. There is a free daily walking tour everyday at 10:00 a.m., and golf cart tours every hour for R45. On Sundays from November through April, sunset musical concerts are held on the grounds. Prices vary. The entrance fees are R35 for adults, R20 for students and R10 for children. The Gardens are 13 kilometers from Cape Town city center, and are open to the public 365 days a year from 8:00 a.m. to 7:00 p.m. September through March, and from 8:00 a.m. to 6:00 p.m. April through August. If you are visiting Cape Town, be sure to set aside at least part of a day to enjoy the Kirstenbosch Botanical Gardens, but once there you will undoubtedly want to make a whole day of it. Visitors to Cape Town may enjoy taking a scenic day trip to Table Mountain. Just fifteen minutes from downtown Cape Town, this is one attraction that can’t be missed! The mountain is easy to access with transportation options like rikki taxis, metered taxis, sightseeing buses, city buses, or your own vehicle. Once you reach the lower station, climb aboard the cable car to begin the five minute ascent to the top of the mountain. The cable cars rotate 360 degrees offering panoramic views of the city for the entire journey to the top. For the more adventurous tourists, there are also hiking trails to the top. It is about a 3k trek, and is considered challenging. It’s not recommended for young children or elderly. Table Mountain administration also reminds you that high winds can shut down the cable cars, so plan ahead and dress accordingly in case you have to walk back down! Once you are at the summit of the mountain, take in the breathtaking views of downtown Cape Town, the ocean, and surrounding mountains. There are plenty of scenic viewing points on top of Table Mountain that offer spectacular views of sights like Cape Town Stadium, the Cape Flats, and Devil’s Peak. Since the top of the mountain is flat, navigating it is not challenging and makes enjoying the views even better. There are other sightseeing opportunities as well, and there are even wheelchair accessible routes. The flora and fauna in Table Mountain National Park is abundant and exciting to discover. Visitors may see mongooses, snakes, butterflies, lizards, porcupines, and over a thousand different varieties of plant life. For those looking for an extreme thrill, try Abseil Africa! This is a one-of-a-kind experience and can be the most exciting thing you ever do. Step off the mountain at 1000 meters above sea level and rappel down with nothing but the air around you. The abseil from Table Mountain is the highest commercial abseil in the entire world! Tourists can enjoy a meal, snack, or drink at the cafe on top of the mountain. There is also a souvenir shop to purchase trinkets. There is something for every one of all ages and all stages at Table Mountain! Located approximately thirty minutes away from Cape Town, Stellenbosch is a small town in the heart of the Cape Winelands. Franschhoek is located about thirty minutes east of Stellenbosch. As such, both towns are easily accessible from Cape Town and great places for a day trip. There are numerous private and group tours with daily departures that can be arranged from Cape Town. It’s also an easy trip to self-drive by hiring a car for the day, especially when traveling with two or more people. The obvious reason that most people visit Stellenbosch and Franschhoek is to see the many wineries. 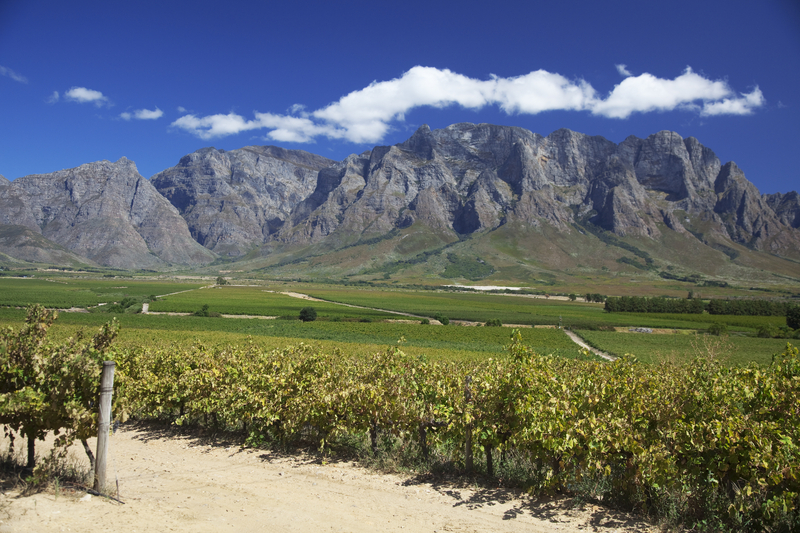 Many of the wineries are easily accessible by foot, but others are best reached by minibus or van, which can be arranged through the wineries themselves or as part of a longer trip from tour operators in Cape Town. Most winery tours include wine tastings and tours of the wine making facilities. Other tours may include lunch or historical guided tours through the towns of Stellenbosch and Franschhoek. Despite the wineries being the biggest draw, there are many other activities available in Stellenbosch and Franschhoek. The close proximity of the wineries means that local restaurants are of very high quality, with plenty of fresh local food and wine. These are great places to eat lunch or dinner, or even buy items such as fresh fruit, bread, meats, and wine for a picnic. In addition to the many wine tastings, there are also cheese tastings. For travelers who are outdoor enthusiasts, there is plenty to do in Stellenbosch, Franschhoek, and the surrounding areas. There are many great places to go hiking, biking through the vineyards, rock climbing, and for real daredevils, skydiving. There are also several golf courses in the area. Stellenbosch also has several museums to tour, including The Stellenbosch Museum and Fick House, both excellent examples of colonial Dutch architecture and a glimpse into a different time. Franschhoek has the Huguenot Memorial and Museum, a museum about the town’s founders, the French Huguenots who fled Europe during the Inquisition. Both towns also have a variety of places to shop, with Stellenbosch having more options, with lots of places to buy jewelry, clothing, wine, art, and other fun trinkets.